now blaxxun, my loveley home for the past 5 years is in trouble. Seen that in the past with Cosmo Software/SGI, Newfire, Intervista, VReam, Platinum/CA put Cosmo in the dust. MM Whats wrong with 3D ? A great project from the Cybertown world builders guild. Real Networks RealOne now manages a media database. Musicmatch Jukebox and Microsoft Windows Mediaplayer are getting better. There are attempts (moodlogic.com) to analyze MP3 data in order to detect style, tempo and similar artitsts. A complete 3D model of the earth in VRML is dynamically created from a GTOPO30 database. I think its the largest walkable VRML model ever generated. As a nice complementary project see Stan Odgen's project Landmark, where visitors can plant trees. A fun VRML game, yes done by Roland Smeenk. Sound design in VRML ? Contact 5.1 improves support for 4 speaker setup. This allows to position sounds around you. drag new MP3 (<200K )/ wav files or url's into scene, to create new balls, if the cursor is over a sound ball there is an additional menu on right-click. Some more sound files from ejay.de are here. After playing with EAX and some other Direct Sound options, I think more support for these features should be added in some next Contact version. A little fun extension in Contact 5.1, the screen is not cleared between renderings. So if the viewpoint or the object is moving, it is leaving a trail. Deepwave from Geometrek is a plugin for Winamp. It allows getting spectrum data from the current playing song and to driver an animation in VRML with that data. 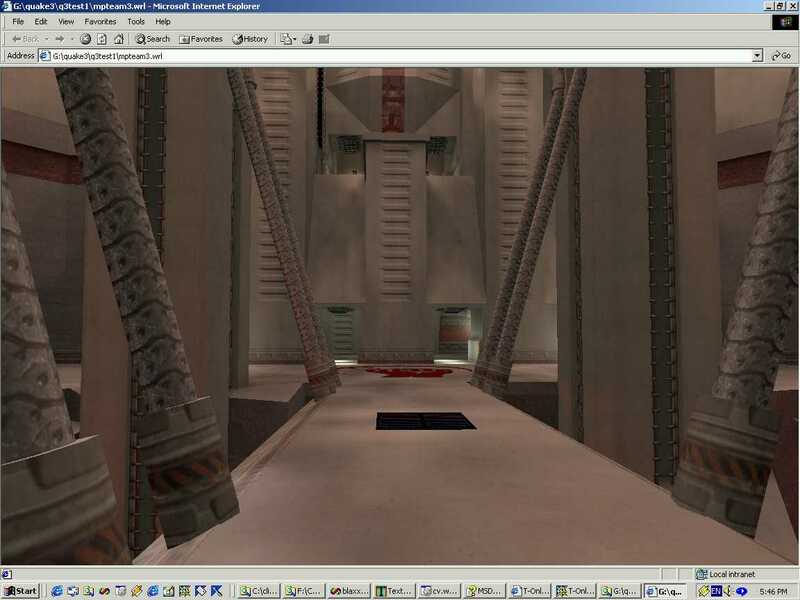 An after hour project to convert Id software's Quake 3 levels to VRML with optional support for Contact 5.0 multitexturing. Basic geometry and lighting effects are transfered, its not completed as it could be. Using quake map lighting tools for creating light maps.